The BoBunny Blog: Mixed Media With Love & Lace! 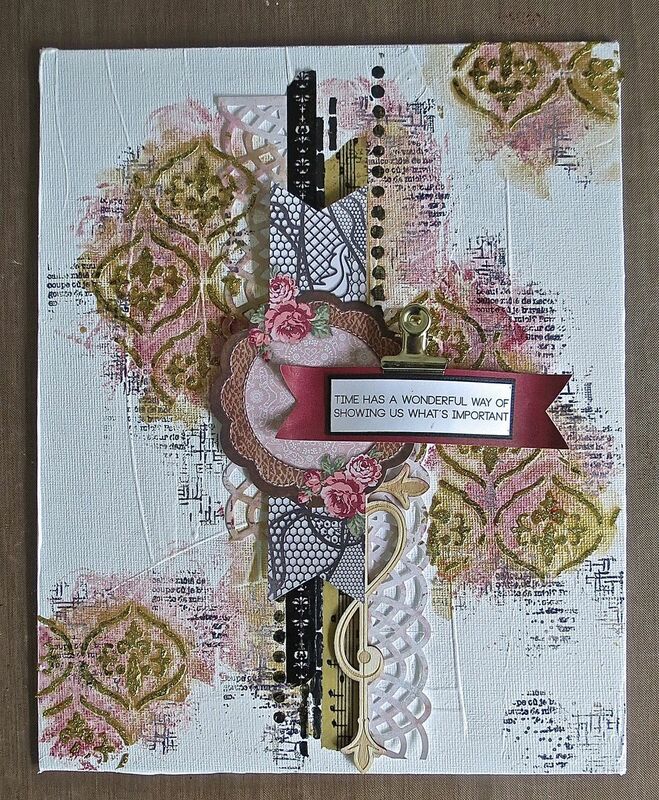 Mixed Media With Love & Lace! First of all you need to prepare your surface so I have rather haphazardly applied my gesso all over my canvas quite thickly. Paper tends to buckle if you use to much. 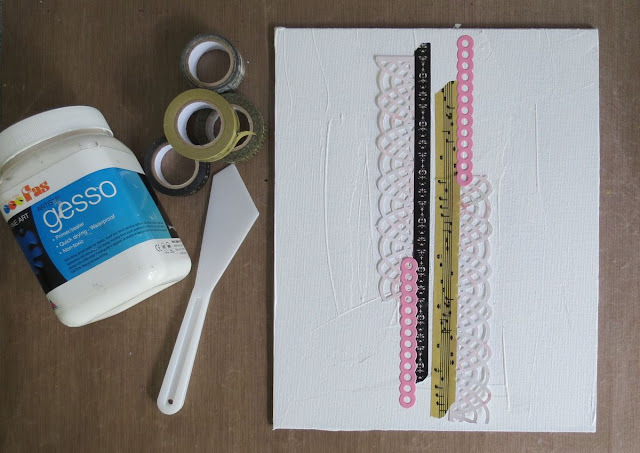 With paper I dry brush on my gesso. 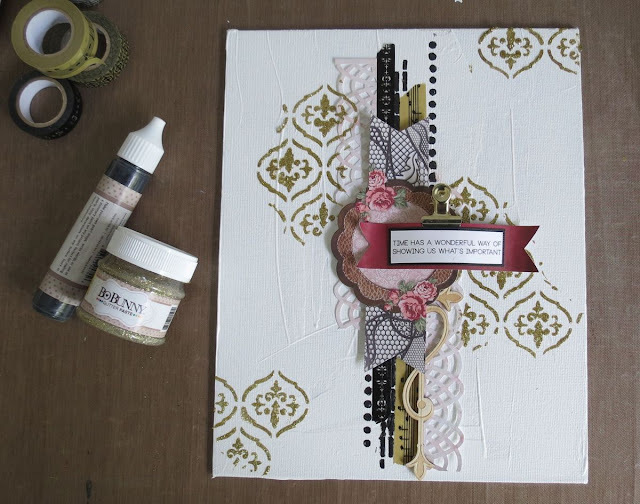 Once dry I added pieces of washi, punched strips of paper and then lined up two of my border stickable stencils. To cover the border stencil I have used Licorice Pearlescents and just applied it straight from the bottle. Once that was dry I chose the Noteworthy piece I want to use and popped some chipboard in behind it to give dimension, and added my typed quote to a strip of paper made into a banner. The binder clip was the prefect addition :) OK, so now that I'm happy with placement I can then add in another stencil using gold glitter paste. Now the fiddling begins! To add colour Ive used a paint brush dipped in my sprays and roughly applied it where I wanted. Start with the lightest colour first, in this case it was gold. Once dry I added the darker red colour but this time I lightly patted this dry with a wet wipe. 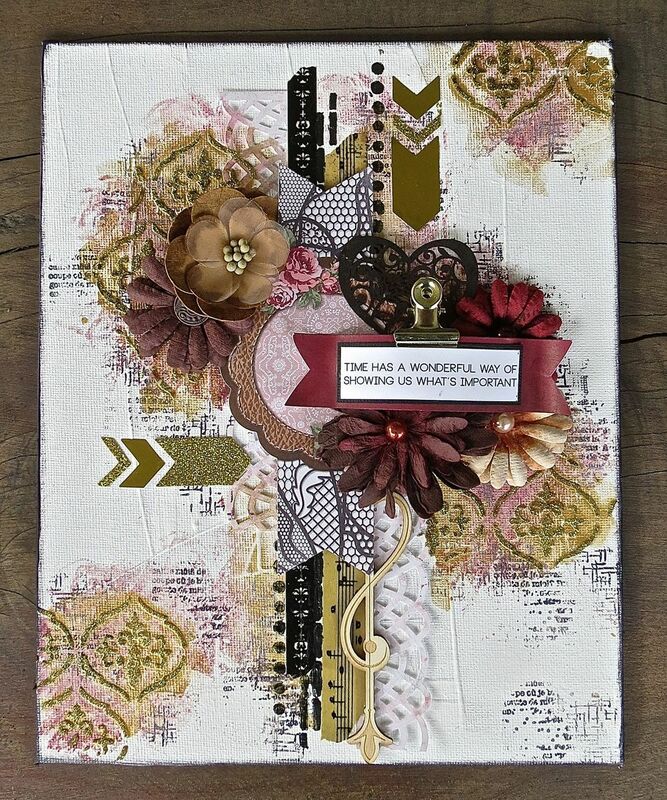 When that was dry I then randomly stamped over the background with two different stamps. I had thought it was finished but thought it needed something more, so I added blossoms, wood shapes, a lser cut chipboard heart inked black - it reminded me of the lace in the paper :) - and lastly those yummy new glitter and foil stickers!! Absolutely phenomenal. Thank you so much for the tutorial. I have yet to try mixed media, but as soon as I think I'm ready... I'm going for it. Thanks for the tutorial & product list.